Camas Center members are ensured a quality health experience and the opportunity to participate in positive, healthy activities. The fitness area at the Camas Center offers trained staff to assist members in reaching their fitness goals. Please call us for our weekly classes at 509.447.7122 or download our fitness class schedule here and our fitness area rules here. Our lifeguard staff includes fifteen certified guards. There is also a pro shop that provides amenities such as goggles and swim diapers. Children 11 & under must have an adult (18 or over) present IN the pool area. Children 5 and under must have an adult present IN THE POOL with them. No children under age 7 allowed in hot tub. No children under age 16 allowed in saunas. 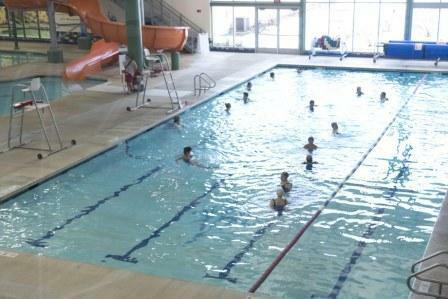 Pool use can be suspended based on lifeguards' judgement. Monday – Friday 6:00 a.m. - 8:00 p.m. Saturday 8:00 a.m. - 8:00 p.m. The Camas Center is closed Sundays during the summer, beginning Memorial Weekend through Labor Day Weekend. One time application fee of $10.00 per person applies to all (maximum of $50.00 per household). Family Membership Monthly Rate includes 30 hours of walk-in child care per month. Corporate rates are available. We now offer Day Pass Bundle punch cards which are good for 10 visits to the Camas Center. Please contact the Membership desk for more details. Drop-In Childcare is a safe and secure place to bring your child. Our friendly staff is trained to give your children quality care while you are at the Camas Center, or if you have an appointment in our medical or dental clinic. Family memberships receive 30 free hours of Drop-In Childcare per month, and additional hours can be purchased at the membership desk. Drop-In Childcare is now open to Day Pass Users also for a $5.00 fee per child for up to 2 hours per day. A Parent / Guardian must remain on the premises of the Camas Center at all times while your child(ren) are in Drop-In Childcare. Our schedule is subject to change depending on availability. Additional times may be accommodated by appointment if requested one day in advance by calling (509) 447-7166. Please contact Membership Services for more information. The Camas Center Deli, open daily until 6:00 PM, offers a variety of healthy options for breakfast, lunch and dinner. We prepare fresh food daily to ensure a high quality meal, offer a “hot special” every day, and you can order ahead by calling 509.447.7175 anytime after 5:30 AM. We can also cater your business meetings at the Camas Center. Please contact us at least one week in advance to ensure we have enough time to accommodate your needs.